During his appearance on the Daily Show with Jon Stewart, David Barton claimed that John Adams believed in the Trinity and avoided discussing the meaning of John Adams letter to Benjamin Rush where Adams invokes the Holy Ghost. Last week, I noted that John Adams denied the Trinity in correspondence to Thomas Jefferson, who also denied it. In this post, I take up the letter from John Adams to Benjamin Rush where Adams discusses the Holy Ghost. On the Daily Show, Jon Stewart read a portion of the letter to Barton which referred to the Holy Ghost. The transcript of that segment is below. Elsewhere, Barton has written that the Holy Ghost letter is in some way related to Benjamin Rush’s effort to reconcile Adams and Jefferson. This post refers to what Adams was really saying in his letter to Rush and the next post takes up the reconciliation between Adams and Jefferson. Stewart: Do you think people would be more comfortable with you if they felt like you were consistently looking to extend historical context and — because there are a lot of critics out there who say you cherry-pick your religious facts, take them out of context — your historical facts — to use them to bolster your argument. Barton: They’ve never proven that. They’ve claimed that. Show me some documentation where it’s taken out of context. They’ve never provided that. They complain about it. Barton: No, I don’t recall him saying that. Have you got the quote? Stewart: Yeah, let me see if I can find it. [consults notes] Okay, here it is. Here is what you wrote in your book about what Adams said, endorsing the Church being involved in the State: “The Holy Ghost carries on the whole Christian system in this earth. Not a baptism, not a marriage, not a sacrament can be administered, but by the Holy Ghost, who is transmitted from age to age by laying the hands of the bishop upon the heads of candidates for the ministry. […] There is no authority, civil or religious; there can be no legitimate government, but what is administered by the Holy Ghost. There can be no salvation without it; all without it is rebellion and perdition, or in more orthodox words, damnation.” That’s the quote that you used in your book. Barton: Now, I have the original John Adams letter with me off the set. I brought the original. See, I posted that online; how can I misquote it when I put the whole thing up there. That’s the only John Adams letter in the world that he wrote on that day to that person, and that’s what’s in it. I posted that where everybody can see it, and that’s what we do with our documents. Barton: Oh, the entire letter is posted. The entire letter is posted. Stewart: But you can see that the next sentence shows that he’s being sarcastic in that passage. Barton: Not in — no, not at all. You read the entire letter, Jon — now, see, they’ve given you their critique of it. Stewart: But how could he say the Holy Ghost — I mean, this man was a Unitarian; why would he claim the Holy Ghost sincerely? Barton: You know what a Unitarian was then? Stewart: Yeah, someone who didn’t believe in the Trinity. Stewart: So John Adams believed in the Holy Ghost? David Barton does indeed have the original letter from John Adams to Benjamin Rush in his collection and has a picture of it on his website. Stewart asserts that Adams’ use of the terms “artifice and cunning” was sarcasm toward the belief that the Holy Ghost sets up governmental and religious authorities. Barton said Stewart was wrong. However, Stewart did not press Barton to say what he thought Adams meant. Too bad, because I would like to hear Barton’s explaination of Adams’ statements in context. This letter is important to Barton. In a related article, Barton claims that Adams references to the Holy Ghost were in some way a reply to Benjamin Rush’s wish that Adams and Thomas Jefferson would reconcile their differences. An examination of the series of letters in 1809 makes this assertion very unlikely. This issue has been visited in depth by Chris Rodda (this video, this article, and then her book – now free on her website– are must reads) and then lately by Messiah College historian John Fea (this post and his book are also must reads). In addition to consulting these resources, I also looked at the original sources myself. In short, Barton has taken correspondence between John Adams and Benjamin Rush, and selectively quoted from those letters to create a fiction, one which he repeated on Jon Stewart’s program. This post provides evidence to contradict Barton’s claims. To understand the various claims about Adams, Rush and the Holy Ghost, one must read the relevant series of letters between Adams and Rush. Three of these letters are easily available on the internet; the other one, from Rush to Adams dated December 5, 1809, I reproduce below. Rush and Adams were good friends and exchanged warm and friendly correspondence often. In his letter to Adams on October 17, 1809, Rush used the device of a dream to express his wish that Adams and Thomas Jefferson would again resume communications. Read all four letters here. BECK: On that program, what took a lot of viewers by surprise was that some women actually served in the military during the American Revolution. BECK: I have to ask you about this handsome lady. BARTON: 1782, she wanted to do something for her country. She dressed like a man and went and enlisted. Now, what’s interesting is she’s 22 years old at the time and other guys in the army, I always kid her about, you never shave. You’re just a kid. Of course, she didn’t shave. She’s a lady. She got wounded in a battle up at West Point and she treated the wound herself so no one would find out what her gender was. BARTON: She later, in Philadelphia, came up with a really high fever, almost unconscious and so the physician had to check her and at that time, find out what her gender was. So, when they found out her gender, they quietly moved her out of Army. But General Henry Knox is the one that gave her an honorable discharge out of the Army at West Point. BARTON: She ends up with a military pension because she served as a soldier. And if you were a soldier, you got the pension so pretty cool story. I wrote about it when it was news, and now the case has finally been decided. Lesley Pilkington lost. The article by Strudwick is intriguing and provides insight into the British system — which may be changing if critics have their way. President Obama’s Aunt, the Rev. Margaret Obama from Kenya, graduated recently from the Unificationist Theological Seminary according to a statement on the church’s website. Friends, family and fellow students enthusiastically applauded as twenty-two students received their diplomas at the 35th commencement ceremony of the Unification Theological Seminary (UTS) at its New York City campus on Thursday, May 19, 2011. The 15 students receiving their Masters in Religious Education included Rev. Margaret Obama from Kaisumu, Kenya, U.S. President Barack Obama’s aunt, who wrote her thesis on “Religious Education to Support Orphaned Teen Girls in Kenya: a Curriculum.” Rev. Obama has told friends that she will spend the coming year doing pastoral care in service to her local church, the Church of the Incarnation, in Jersey City, New Jersey. 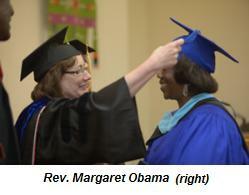 “I learned so many good things at UTS,” Rev. Obama told Familyfed.org. “Many churches concentrate on taking care of their own, but the Unification community focuses upon serving those outside their own group,” she said. “They [the Unificationists] cherish family values, making husbands, wives and children the priorities, and I believe that by promoting family values, they are building world peace, because peace in the family easily extends to the larger world,” she told familyfed.org in a telephone interview. Rev. Obama says that she became involved with Unificationists after attending seminars of the Women’s Federation for World Peace in Kenya in 2005. The Unification Church is comprised of families striving to embody the ideal of true love and to establish a world of peace and unity among all peoples, races, and religions as envisioned by Rev. Sun Myung Moon. Members of the Unification Church accept and follow Reverend Moon’s particular religious teaching, the Divine Principle. Unificationists believe that Rev. and Mrs. Moon are the true manifestations of the masculine and feminine elements of God. Rev. Yang came on the second last day and explained about Father’s life, concluding with some exciting new information. The newly elected United States’ president, Barack Obama, has been attending ACLC conferences and has apparently met with Father on several occasions. Even just before the elections, he attended a prayer breakfast. His wife is involved with our movement as well. This is a new revolution, now that Obama has become president; Father wants to eradicate all barriers between races. I should add that there is no confirmation that any of those claims are true. Unificationists are keen on political connections and once used the Dirksen Senate building as the site of the coronation of the Moons as the King and Queen of Peace. They then use these real and implied connections as means to paint a skewed narrative to the faithful. I suspect the graduation of Ms. Obama will be added to the narrative of the Obama’s as supporters of the Moon’s place as True Parents. During his appearance on the Daily Show with Jon Stewart, David Barton claimed that John Adams believed in the Trinity and avoided discussing the meaning of John Adams letter to Benjamin Rush where Adams invokes the Holy Ghost (at about 9 minutes in the clip). Stewart cut in at that point with a comment on The Treaty with Tripoli John Adams negotiated with the Barbary pirates. That is another story. For now, I want to address Barton’s claim that Unitarians and John Adams believed in the Trinity. My next post will examine Barton’s use of Adams’ letter to Benjamin Rush where Adams discusses the Holy Ghost. In 1819 William Ellery Channing preached a famous sermon in Baltimore at the ordination of Rev. Jared Sparks. The title of his sermon was “Unitarian Christianity.” That brought to a head an ongoing battle between the religious liberals and the religious conservatives in the Congregational Church, of which John Adams was a member, but on the liberal side. The American Unitarian Conference, later Association, came into being in 1825, a year before his death (and Thomas Jefferson’s), but both of them were very sympathetic to the anti-Trinitarian views that were at the heart of the controversy. Unitarians were never okay with the trinity. Hence the name. Most of them like Jesus, but as a prophet, a role model, a nonviolent revolutionary. Not God. As support for Ulbrich’s statements regarding Adams, I reproduce here an exchange about the doctrine of the Trinity between Thomas Jefferson and John Adams. First Jefferson wrote to Adams on August 22, 1813. Adams wrote to Jefferson in reply and affirmed the same views regarding the Trinity. JOHN ADAMS TO THOMAS JEFFERSON. DEAR SIR,—I owe you a thousand thanks for your favor of August 22d and its enclosures, and for Dr. Priestley’s doctrines of Heathen Philosophy compared with those of Revelation. Your letter to Dr. Rush and the syllabus, I return enclosed with this according to your injunctions, though with great reluctance. May I beg a copy of both? They will do you no harm; me and others much good. I hope you will pursue your plan, for I am confident you will produce a work much more valuable than Priestley’s, though that is curious, and considering the expiring powers with which it was written, admirable. The bill in Parliament for the relief of Anti-Trinitarians, is a great event, and will form an epoch in ecclesiastical history. The motion was made by my friend Smith, of Clapham, a friend of the Belshams. I should be very happy to hear that the bill is passed. The human understanding is a revelation from its Maker which can never be disputed or doubted. There can be no scepticism, Pyrrhonism, or incredulity, or infidelity, here. No prophecies, no miracles are necessary to prove the celestial communication. This revelation has made it certain that two and one make three, and that one is not three nor can three be one. We can never be so certain of any prophecy, or the fulfillment of any prophecy, or of any miracle, or the design of any miracle, as we are from the revelation of nature, i. e., Nature’s God, that two and two are equal to four. Miracles or prophecies might frighten us out of our wits; might scare us to death; might induce us to lie, to say that we believe that two and two make five. But we should not believe it. We should know the contrary. Had you and I been forty days with Moses on Mount Sinai, and been admitted to behold the divine Shekinah, and there told that one was three and three one, we might not have had courage to deny it, but we could not have believed it. Adams ridicules the idea of a trinitarian deity, saying that even if Jefferson and he were the presence of God, they would be unable to believe in the Trinity because it is an unreasonable doctrine. Reason, granted by God, asserted Adams, would prevent such belief. Historian John Fea, teaching at evangelical Christian Messiah College agrees that Adams rejected the divinity of Christ, hence also the Trinity. Although, as Fea notes, Adams attended different churches, his views settled on a Unitarian theology, very much at odds with orthodox Christianity. As always, if anyone has information that indicates Adams did believe in the Trinity, please pass it on. For now, it certainly appears that John Adams and the budding Unitarian movement did not hold to the doctrine of the Trinity. Interesting article in the Baptist Standard newsletter online here. Recently, Dallas Baptist University professor Stephen Stookey took on David Barton’s view of Christian America and linked it with Mormon theology in a way that I had not considered. He also distills three possible reasons for Barton’s appeal. • Historical ignorance. “In general, Americans tend to have minimal knowledge about the details of American history. We highly value our Founders and want to think the best of them. We are familiar with elements of Christianity’s history in the United States. Thus, it is easy to assume a golden age of Christianity once existed in the colonial and early federal period of our national story,” he said. • Political tensions. “The alleged culture wars appear to have accentuated political divisions—between Democrats and Republicans and within parties,” he said. I am skimming the surface here, but I encourage you to read the article. Stookey’s descriptions of Barton matches up well with what I have found thus far. Bahati continues to say the death penalty will be removed. Certainly the punishment of death penalty is something we have moved away from- attempt to commit homosexuality is something we have also moved away from. There are a number of amendments we have made, and those are going to be brought forward. Since we have moved it, we have listened to a number of views from a number of stakeholders, and all those views have been incorporated in the amendments, which will come when we happen to bring it. The committee report I have does not remove the death penalty. In this part, Bahati admits that the bill is not necessary to address defilement. The Monitor reporter asked why the law is needed when laws addressing child protection are on the books. Do not miss the significance of this. Bahati and Ssempa have been saying that the law is needed to protect boy children. The Penal Code Amendment Act made the defilement laws very stringent and gender neutral. Finally, note the time frame of addressing a new version of the AHB: a few weeks from now. The close of this (8th) Parliament is just pressing on the pause button-in a few weeks when Parliament resumes we will begin the process of legislating against homosexuality. Kasha provides her point of view, and she says they will challenge the bill in court. The current bill would have many problems which would make it immediately vulnerable to a court challenge (e.g., see this excerpt of a longer critique by Makerare University law professor Silvia Tamale). May 21, 2011. We got us a field experiment in the making to test this hypothesis. For now, let’s sing. Scroll to the bottom for updates. While I cannot confirm the BBC report, it is certainly possible that the reporter, Joshua Male, spoke with MPs who want to enact the unfinished bills and hope they are reintroduced. At this point, however, formal action is not on the agenda. Although nothing appears imminent, the situation is not predictable. In the waning hours of the former Parliament, David Bahati speculated that the new Speaker might cause certain bills to be carried over. The new Speaker does have some incentive to carry over the Marriage and Divorce Bill and might also include the Anti-Homosexuality Bill, perhaps in exchange for support on getting the Marriage and Divorce bill passed. UPDATE: The Public Order Management Bill is the first bill that President Museveni’s administration wants the Ninth Parliament to consider. Note in this Monitor report that the government supporter does not expect passage until July or August. The former State minister for Internal Affairs, Mr Matia Kasaija, confirmed yesterday in an interview that he is working to make sure the Bill is passed. “Be assured I want it off my desk as soon as the 9th Parliament settles to work. I would have wanted it passed by July or latest before the end of August,” Mr Kasaija said. This bill will most likely be a priority as the NRM supported Speaker begins developing a legislative agenda. UPDATE: This Daily Monitor article reports that a handful of bills, including the Anti-Homosexuality Bill will be reintroduced in Parliament during this new session. First-term MPs will, however, face challenges in dealing with the unfinished 2011/12 budget scrutiny and other key Bills in the House. Some of the Bills expected to be returned to the House include; The Retirement Benefits Sector Liberalisation, Bill 2011, Anti-Gay Bill, Marriage and Divorce Bill, HIV/Aids Prevention and Control Bill, Regional Governments Bill, among others. What is not clear to me is how this reporter means, “returned.” I fully expect the bills to be reintroduced, perhaps in amended form. This unconfirmed report suggests that there are political motives for the reintroduction. However, the procedural question is whether or not private members such as Bahati will need to go through the process of getting permission first before he tables the bill. If the Anti-Homosexuality Bill 2009 is simply returned to the newly organized Legal and Parliamentary Affairs committee, and the movement of the bill resumed where it left off, then action on the bill could take much less time than if the procedure was to start from scratch.